Below is a list of currently available paperback books, Nook and Kindle products. Don’t have an eBook reader yet? No problem, download a free ap for Kindle and read eBooks and blogs on most major smartphones, tablets, and computers. Writing for Profit or Pleasure; Where to Publish Your Work, is 146 pages, 30,000 words of concise, insightful information about where and how writers can achieve publication of their writings. 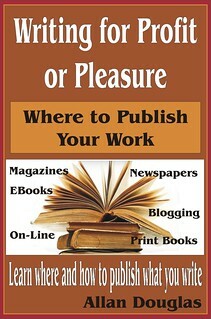 Whether you write for income or for the joy of it, whether you aspire to write on-line or for print, this book has a wealth of information to help you find and secure publication including self-publishing eBooks, finding a traditional publisher, writing for magazines and newspapers, and on-line through a blog, eZines or content mills. 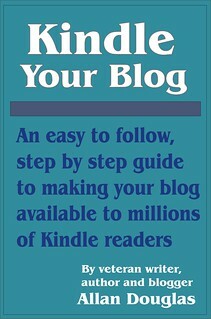 Kindle Your Blog is a tutorial for publishing your blog on Amazon’s Kindle. It describes in detail what information and graphics you need to have at hand, and how to produce them, before you begin the submission process. Then it takes you step by step through the process in a clear, straight forward manner. The blog you’re visiting now is available for the Kindle or a Kindle app on your computer, tablet or phone. Included are a growing collection of articles on the topic of being a writer. Some apply to blogging, some to writing for magazines, some to writing a book, some to marketing your work, and some to the life, frustrations and blessings of being a freelance writer and mountain man wannabe. Also included are the Doggy Tails stories and a collection of articles addressing dog training and health issues. Another collection is the Christian Education articles covering a Biblical approach to life. Beyond all that are the Mountain Man Wannabe stories of our adventures as newbie Mountain Folk. All for a monthly subscription price of just 99 cents. You can’t even buy a cup of coffee for that! Kindle blogs are fully downloaded onto your Kindle so you can read them later even when you’re not wirelessly connected. And unlike RSS readers which often only provide headlines, blogs on Kindle give you full text content and images, and are updated wirelessly throughout the day. Subscribe now to get your 14-day Free Trial. Your issues will be sent automatically and wirelessly to your Kindle via Amazon Whispernet. No cables, no computer, no syncing. You can cancel at any time during your 14-day free trial, and you will not be charged. If you do not cancel within the 14-day period, your subscription will continue at the regular price using a payment method Amazon.com has on record for you. You are eligible for only one free trial per periodical. Recent blog entries are automatically saved on your Kindle. Older blog entries are automatically deleted. Learn more. Blogs you purchase are only available for download on one Kindle unless you purchase more than one subscription.